The North Bridge at Cardiff Castle is an important access route for vehicles, recent concerns regarding the capability of the bridge to carry increased loads required a detailed inspection of the structure. 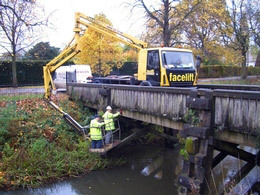 Before work commenced it was necessary for our Bridge inspection team to provide full technical specifications of the under bridge unit to be used, so that calculations regarding point loadings could be approved before the unit was placed on the bridge. Edward Hill, the Engineer on the project commented "The UB40 was the perfect access platform for the job, the survey went very smoothly".